As explained in a previous post, nobody can boast about being the father of the Smart Grid concept. No organization, no expert, did succeed in imposing his own definition. I probably won’t, like my predecessors, but I cannot help but try my chance. “Catch phrase” or “tag line”: understandable by anybody and easy to remember. One phrase definition: brief functional definition. One page definition: detailed functional definition with Smart Grid’s key success factors, characteristics and domain of activity in which high performances have to be achieved. The format is purposely based on lists to make the reading easier. The Smart Grid is the vision of the grid of the future, optimally efficient, economic, reliable, secure, safe, flexible and sustainable. 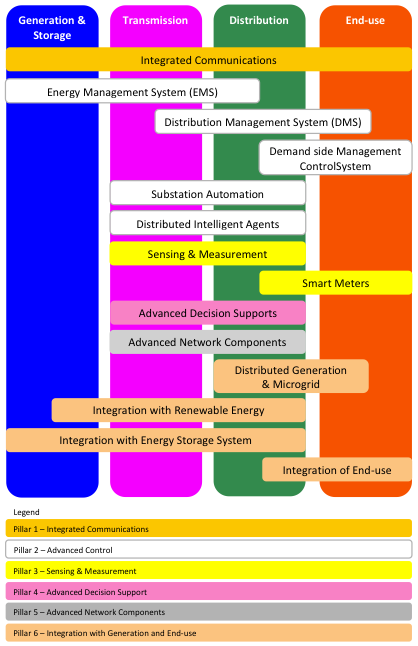 The Smart Grid is the vision of a highly automated and interconnected network where power, information and knowledge flow bi-directionally through intelligent systems to transparently serve all stakeholders and users, enabling high performances in planning, operation and maintenance with optimal efficiency and reliability, at lowest cost and in a reliable, secure and safe manner without harming the environment. Integration with generation and end-use. Dupont Energy Consulting GmbH is happy to share with you the comprehensive list of facilities and projects of NAS battery storage systems in the world (see table below). We hope you will find the info interesting. If you use it in any of your document, report, web site, etc., please reference the current page and mention the name of our company “Dupont Energy Consulting GmbH”. Thank you for your understanding and for respecting our work. Do not hesitate to put in comment at the bottom of the current page any additional information you may have (on listed projects or projects not in the list). Upon verification, we will accordingly update the list. We take the opportunity to make a call. We would like to compile an inventory of other types of large-scale batteries installed around the world (1 MW and above). It would be nice if you could send us information or post it in comment below. When enough data will be collected, the list will be shared on the same blog and on LinkedIn. NAS Batteries back in the race soon ? Tohoku Electric Power Co. Inc. set up a sodium sulfur (NAS) storage system at its Noshiro fossil-fuel-burning power plant. The system comprises forty 2 MW NaS batteries from NGK Insulators Ltd. able to continuously supply 80 MW for six hours. When it will be operational, it will be the biggest battery storage system in the world. The system aims to prevent blackout in summer, thanks to load leveling (the batteries are charged during the night when the load is low and discharged in the afternoon during peak load hours). Tohoku EPCo is indeed unable to supply enough power because of the damage caused by the earthquake of March 11, 2011 (the one with the tsunami and Fukushima nuclear disaster). It was expected to be running in January 2012, but because of the fire incident that occurred on September 21, 2011, the commissioning is postponed to April. This announcement looks innocent, but it tells us that it seems that NGK is close to solve the problems raised by the fire incident. Filed under Storage systems Tagged with batteries, battery, fire incident, Japan, NAS, NGK, NGK Insulators, Sodium-sulfur battery, Tohoku Electric Power Co. Prevailing wind pattern found in the tropics is not very favorable for power generation. 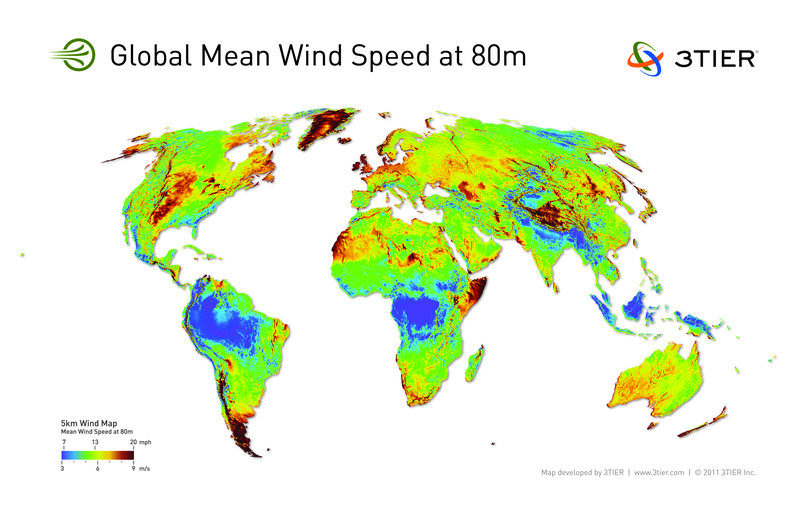 Mean wind speed is globally smaller than in Europe and the USA (see the map), except along some coasts (clockwise): North of Senegal, Mauritania, Morocco, Egypt, Somalia, Kenya, South Africa and Namibia. Best spots are predominantly remote, inhabited, and without infrastructures (road and power network). Wind maps, like the one displayed opposite, are created by models based on mathematical equations that describe the physics and dynamics of the atmosphere, calibrated from observational data. The more measurements, the higher the accuracy. Wind measurement at wind generator height is a scare resource in Africa. Few measurement campaigns were performed, expect at some best spots. In vast areas, in particular the Sahara, calculated mean wind speed entirely relies on atmospheric model calibrated from data measured thousands kilometers away. Such results cannot be seriously used. Higher vertical and horizontal resolution, as well as few measurements at 40 m were recently used to produce detailed wind maps for Mali and Senegal. Results confirm that global models overestimate wind speed in the Sahara. Wind potential is limited in a narrow band along the coast, where 8 m/s can be found. Wind speed dramatically declines when entering the continent. Best spots in Mali benefits for a mere 5.5 m/s. Before the national wind map was available, Canadian wind developers supported by the Canadian development cooperation administration convinced the government of Mali to install an hybrid system (small wind turbine & diesel generator) in a remote small town reputed being windy. But the wind people feel is not the one needed for power generation. The wind turbine stands useless most of the time. Inhabitants are frustrated. They were told that the system would produce electricity mainly from wind, but now they have to pay for the fuel. Finally the wind turbine was dismantled and installed in another small town, leaving the diesel generator producing electricity and greenhouse gases. By the way, the same story was repeated in the other town. There is therefore an imperative need in Africa for wind measurements (typically at two thirds of hub height, i.e. 60 m to reach a high of 90 m for the wind turbines) and accurate wind maps. Global maps like the one above, as well as feelings and hearsay, cannot anymore be the only sources of information for decision makers to define investment policy.